Justice Berch began her career as an Associate and Partner with the firm McGroder, Tryon, Heller, Rayes & Berch from 1979-1985, before serving as Director of the Legal Writing Program at Arizona State University College of Law from 1986–1991 and 1994-1995. She served as Solicitor General for the State of Arizona, from 1991–1994, as Special Counsel to the Arizona Attorney General from 1995–1996, and as First Assistant Arizona Attorney General from 1996-1998. 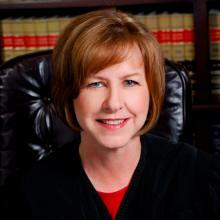 Justice Berch became a Judge on the Arizona Court of Appeals, Division I, starting in April 1998 until March 2002. She served as a justice on the Arizona Supreme Court from April 2002 - June 2005 before becoming Vice Chief Justice in June 2005. In July 2009, she became the court’s Chief Justice – a position she held until June 2014. She earned her BS, MA, and JD from Arizona State University. "I applaud IAALS for taking a leading role in addressing the complex issues facing legal education and new lawyers."